Whether you're travelling on business, visiting family and friends or just want to experience the real New England, fly to Connecticut with Aer Lingus via Dublin to the state capital Hartford. Grab yourself a cheap flight to Hartford and discover how easy it is to travel to North America with Aer Lingus. Connect in Dublin where you can pre-clear U.S. immigration before boarding your flight - that means you can grab your bags and go when you land in Hartford! 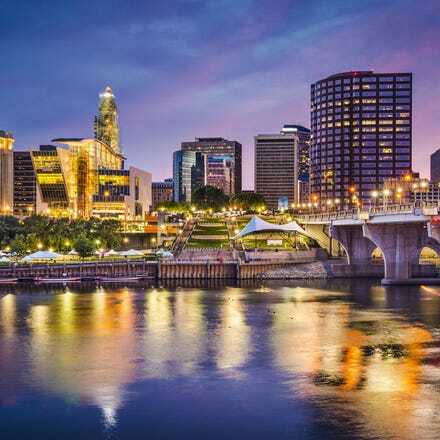 One of the oldest cities in the USA Hartford was founded in 1637. History fans can visit the country's oldest art museum and tour the home of famous former resident Mark Twain. Beautiful green spaces stud the city, but outdoorsy types venture slightly further afield. Hike the Mattabesset Trail and marvel at breath-taking views of the New England city. Frequency: Daily during summer schedule. All flights to Hartford arrive at Bradley International Airport (BDL), which is located approximately 15 miles north of downtown Hartford. The Connecticut Department of Transportation, through CTTRANSIT, provides the 30-Bradley Flyer bus service as a link between Bradley International Airport and downtown Hartford. The trips operate approximately hourly between downtown Hartford and the airport, seven days a week. CT Transit is the Connecticut Department of Transporation owned bus system that serves the Greater Hartford Area. In Hartford there are 30+ local bus routes and 12 express route that serve 26 towns in the Greater Hartford Area. There are also available connections with Middletown Transit (Middletown, CT- 20 minutes south of Downtown Hartford) and CTTransit New Britan (New Britan, CT- 10 minutes southwest of Downtown Hartford). Along the bus route there are usually stops every 1-2 blocks and in Hartford there are usually signs marking the stops. There are a number of taxi and limo companies that serve the greater Hartford area.